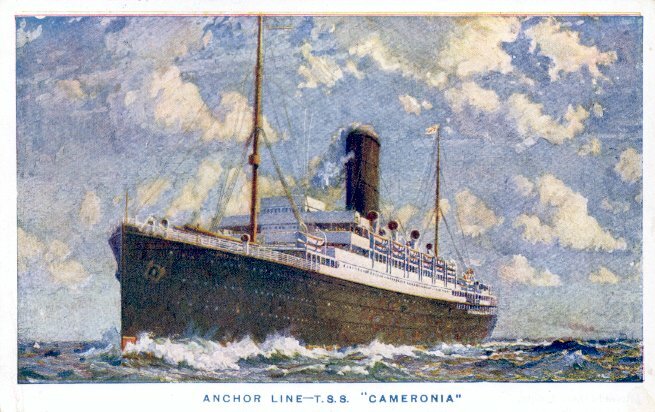 The sister to Cunard's Tyrrhenia/Lancastria, this Cameronia was the second Anchor Line ship of that name. Built by Wm. Beardmore & Co., Glasgow, she was launched in December 1919, a mere 9 1/2 months after her keel was laid. Her maiden voyage, however, did not occur until nearly a year and a half later, as her fitting out was interrupted by a strike. In April 1921 she was towed to Cherbourg and completed there in time for her 11 May maiden voyage on a Cunard/Anchor joint service trip from Glasgow and Liverpool to New York. Cameronia was refitted by her builder in 1928 to address a tendency to pitch heavily; she was again refitted the next year into a cabin/tourist configuration. In 1935, the Cunard-owned Anchor Line went into liquidation. The Anchor fleet and other assets were purchased by a new company, Anchor Line (1935), Ltd., which was completely unrelated to Cunard. Cameronia was one of the assets purchased by the new Anchor Line, but she remained, as she had been since December 1934, laid up on the Clyde. 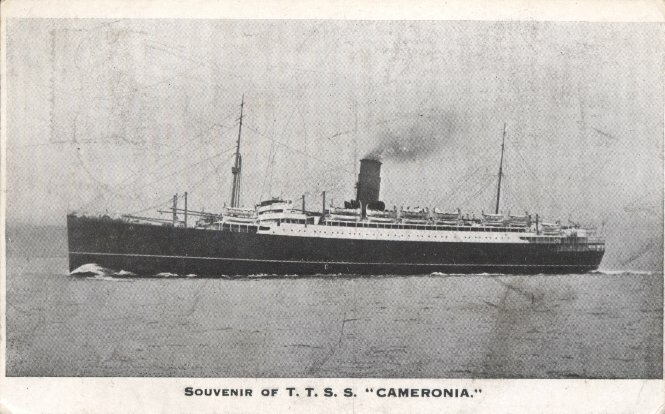 Cameronia returned to service, as a troopship, from the fall of 1935 through the spring of 1936. After another refitting, she returned to commercial service, between Glasgow and New York, in July 1936. She remained in commercial service after war broke out in September 1939, making 11 unescorted Glasgow-New York roundtrips before being called up as a troopship in December 1940. She served in that role until the end of the war, except for the period from December 1942 (when she was damaged and 17 people were killed by a torpedo launched from a dive bomber in the Mediterranean) until June 1943 (when repairs were completed). She was then laid up again. In the spring of 1947, Cameronia returned to service, transporting troops to Palestine. She was then converted into a one-class emigrant ship, and began service between Glasgow and Sydney in November 1948. 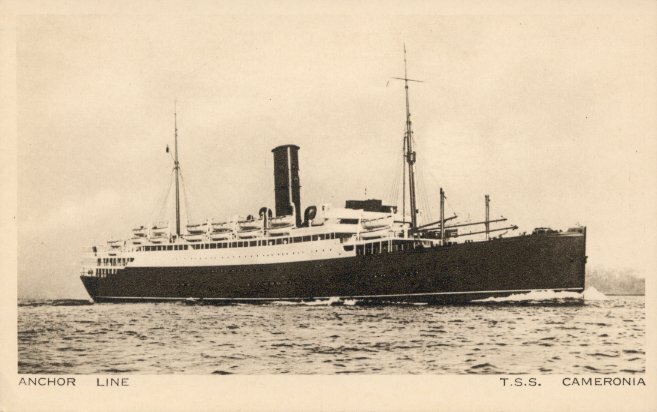 After 11 such voyages, she was sold to the Ministry of Troop Transport, which renamed her Empire Clyde, but operated her under Anchor management. Empire Clyde was sold for breaking up at Newport, Monmouthshire, in September 1957.